We see privilege issues discussed in judicial decisions, legal commentary, and mainstream news. 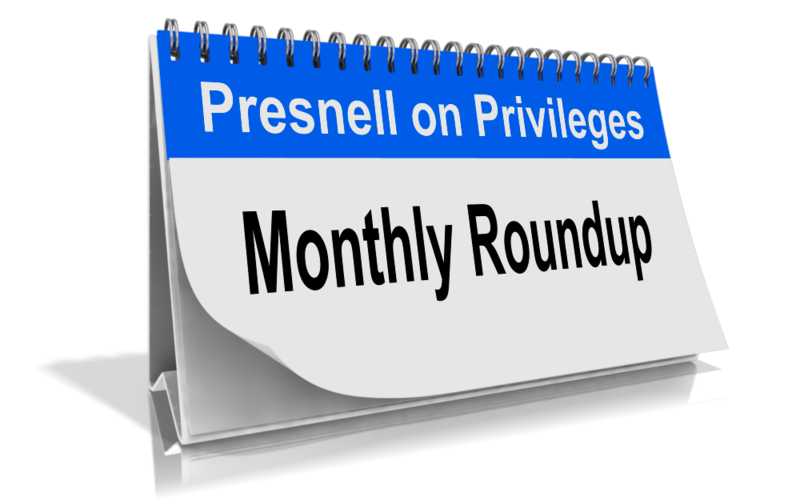 After skipping an October roundup due to a trial, here is a roundup of interesting privilege issues for November 2016. With Senator Sessions’ likely appointment as Attorney General, many are asking whether the Yates Memorandum and its stance on seeking privilege waiver for cooperation credit will change. Jeff Wood’s article in InsideCounsel addresses the issue, and the National Law Journal has comments from Deputy Attorney General Sally Yates. For a refresher on the Yates Memorandum’s effect on the attorney–client privilege, see my article titled Protecting Privilege in a Post-Yates Memorandum World. Vice President–Elect Mike Pence is asserting, in part, the attorney–client privilege as the legal basis to withhold communications with other governors regarding a potential legal challenge to President Obama’s immigration executive order. Story here. A Switzerland federal court issued an opinion that the attorney–client privilege did not protect a company’s outside counsel’s internal investigation report from disclosure to the Switzerland Attorney General. Story here. The New Mexico Public Defender’s office is defending a former luxury home builder against fraud and embezzlement charges, but, citing the attorney–client privilege, refuses to identify the costs to do so in response to a public-records request. Not sure this will turn out well for the Public Defender’s office. An editorial in the Albuquerque Journal is here. Remember Jodi Arias, the Arizona woman who spent 18 days on the witness stand and was convicted of brutally killing her boyfriend? Arizona disbarred her former attorney, Kirk Nurmi, for publishing a book about the case that revealed communications in violation of the attorney–client privilege. Arias’ new lawyer stated that the privilege “follows you to the grave.” Interesting choice of words. Story here. A Texas federal judge issued an injunction prohibiting enforcement of the Department of Labor’s so-called “persuader rule” that would have required violation of the attorney–client privilege. Story here, and my blog post about the persuader rule is here.